Student members of Engineers for a Sustainable World (ESW), along with friends, gather up for a group photo during Sunday’s compost project. Photos by Kate Tindall. 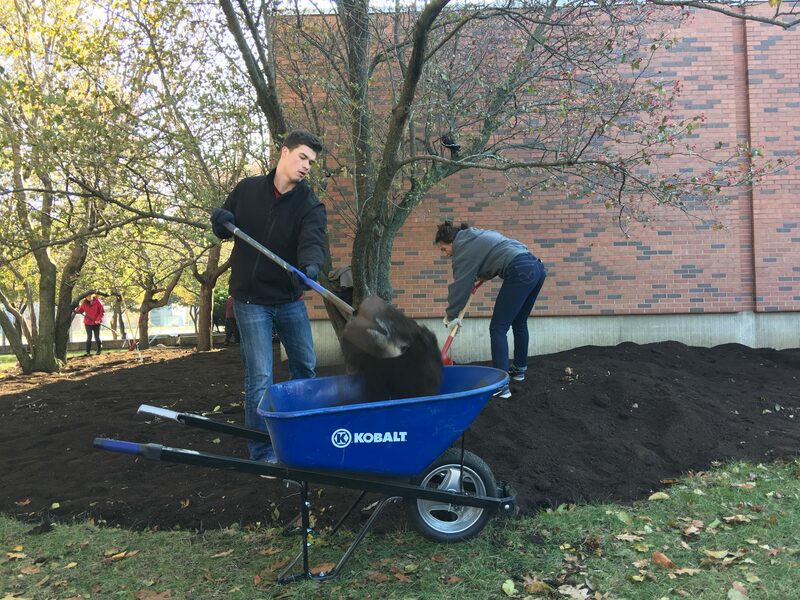 Iowa State University (ISU) produces between 3,500 and 4,000 tons of compost every year. * Where does it all go? 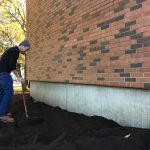 Students and faculty in the civil, construction and environmental engineering department (CCEE) are finding a new way to use this pure compost right here on campus. That’s Carissa Moyna, a sophomore studying civil engineering. Her fascination with compost and its uses started back during high school. Moyna is a University Honors student. 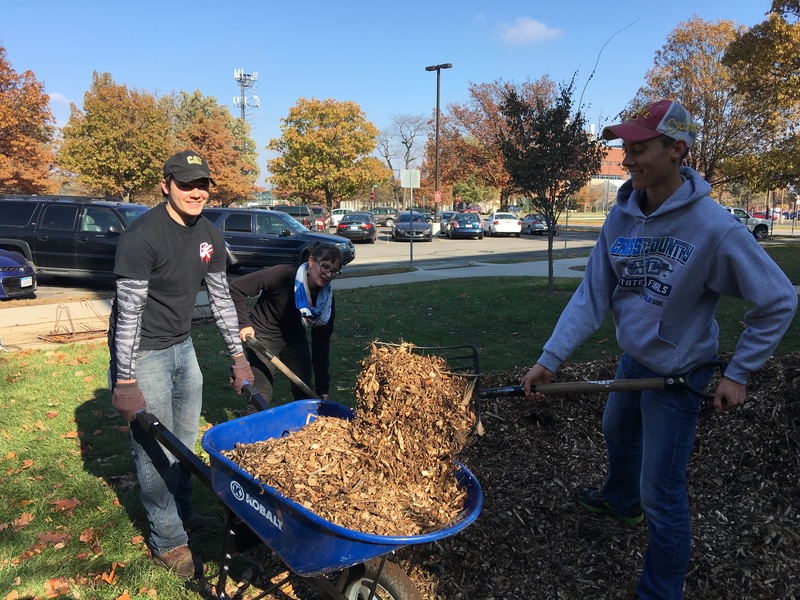 When she came to ISU, she knew she wanted to continue compost research. That’s how she met James Alleman, a professor of environmental engineering. Moyna sought Alleman’s guidance for an honors project. 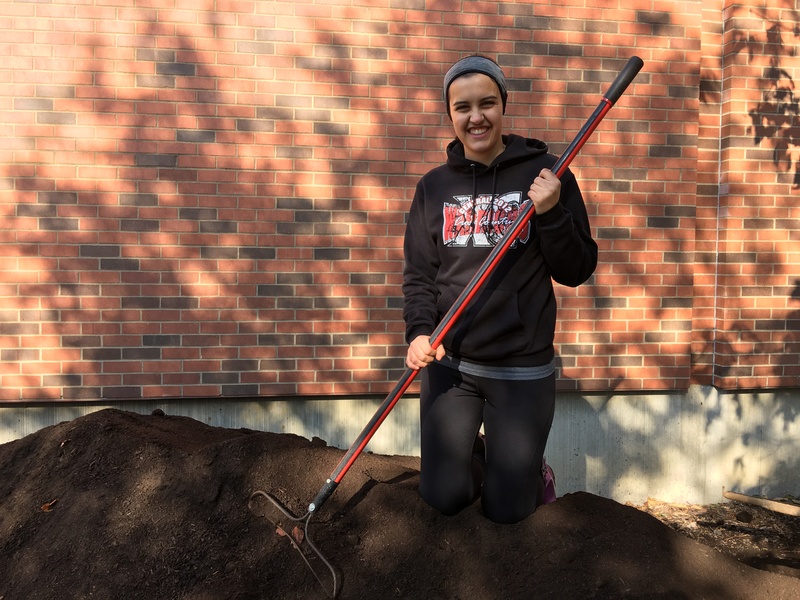 In coordination with Alleman, she came up with an idea to weld her passion for compost projects with her passion for her civil engineering major — using compost as a landscaping tool around the exterior of Town Engineering Building. 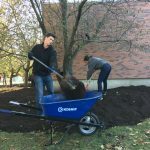 On Sunday, Nov. 12, student members of Engineers for a Sustainable World (ESW) and various volunteers pitched in to lay a layer of pure compost and a layer of mulch outside of Town Engineering. Moyna calculated that the project would call for 20 cubic yards of compost and 20 cubic yards of mulch. 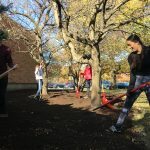 The laying of pure compost is unique to this project, says Lester Lawson, facilities maintenance manager for University Facilities Planning and Management (FP&M). Carissa Moyna (pictured) has enjoyed digging into compost projects since her high school days. In addition to its natural weed killing properties, Lawson added that this technique will improve the soil profile. As a part of her research project, Moyna will observe the landscaping’s effect on weed growth and other properties during the coming semesters. FP&M will also be watching the project. In the long run, Moyna hopes to use Town Engineering as a pilot project demonstrating the use of pure compost for a weed repellent and landscaping tool. She also hopes both university and community groups will try the same technique. 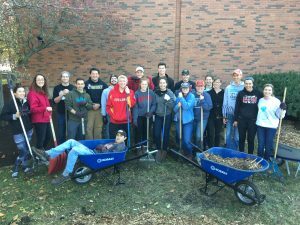 Special thanks to ISU CCEE for donating funds for compost and volunteer efforts. 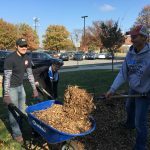 Special thanks also to FP&M for donating mulch, completing edging work around Town Engineering landscaping beds prior to compost being laid, and offering hand tools during volunteer service time. Kaoru Ikuma is an assistant professor of environmental engineering and faculty adviser of ESW. For exciting student success stories, follow ISU CCEE on Facebook, Twitter and LinkedIn (Iowa State University Civil, Construction and Environmental Engineering and ISUConE). East side of Town Engineering Building following the laying of mulch on Sunday. Photo by Kate Tindall.